Patagonia is wild and raw. A special place where nature surrounds you. Every year, thousands of adventure travelers head to southern Chile and Argentina to check out the national parks and natural wonders found here. In Torres del Paine, hiking and trekking is what you come here to do. Wildlife like llamas, guanaco, rhea (a small wild ostrich) and the elusive puma are all native to Patagonia. The beautiful snow-capped Andes mountains backdrop the icey blue glaciers and grassland pastures as far as the eye can see. And travelers can truly experience it to their heart's content. This post contains affiliate links: if you purchase through our links, we earn a small commission at no extra cost to you. This helps us with maintaining our website. Not backpacking - we're talking glam-camping! You might be wondering where to stay in Patagonia if you're not exactly the camping type. The wilderness here is so pristine you may assume the only places to stay would be campgrounds or backpacker refugios favored by hikers and climbers doing the Torres del Paine W trek. Not at all. Turns out, even outdoorsy, day-packers like a little luxury now and then. 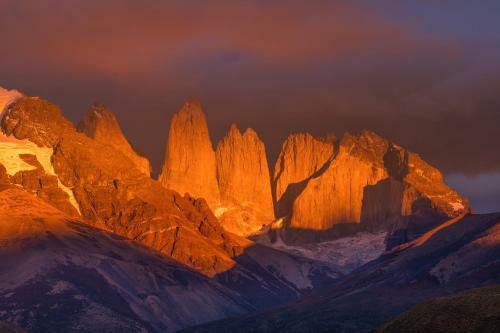 There are enough accommodations in or near Torres del Paine to satisfy most travelers. When I travel, I prefer my hotel matches my trip. For instance, if it's an "active" trip and I'm either trekking Patagonia or lightly exploring the park in and out of a dusty car, I wouldn't feel comfortable in an over-the-top luxury hotel, nor have the time to enjoy it. That's just me. If you think sustainable, stylish digs in geodomes is pretty cool, Patagonia has those too. Perfect for nature-lovers. That's EcoCamp. Glamorous camping - glamping - in roomy, well-appointed and eco-friendly geodesic domes located in the choicest spot you can imagine - at the foothills of Las Torres with a clear view of the granite towers that give the Park its name. The fact that they're the greenest hotel in Patagonia is icing on the cake. Glamping is a great way to enjoy rustic surroundings and stay in tune with the natural world of wherever you travel. Just because you want to be close to nature doesn’t mean you can’t be comfortable, or even stylish! We’ve had amazing glamping experiences all around the world like in Slovenia and Tulum. And Patagonia is one of those places that seems a perfect fit to go glamping! We stayed here recently in early March and had the opportunity to review EcoCamp Patagonia. It was easy to see why autumn here is one of the busiest times of the year. Nature is everywhere, even high up in the trees, where a pygmy owl greeted us! The overall guest experience is supremely comfortable and catered to the individual, with a wide array of choices on accommodations, activities, outdoor excursions, and meals. A top-notch wine list, as you might expect for Chile! For all of the personal touches, EcoCamp infuses your stay with a sense of community and the sharing of those experiences among guests, proving hands down that eco can not only be comfy, but also a transformative - even luxurious - experience. Clearly, they're doing eco right. Read my full review of EcoCamp here. We were guests of EcoCamp during part of our stay in Torres del Paine. As always, all opinions are our own based on firsthand experience. EcoCamp offers semi-private transportation from the airport in Punta Arenas, Chile included in the EcoCamp package you buy. The trip from Punta Arenas to Torres del Paine is approximately a 6-hour trip. Packages include all meals, activities, and guided tours. What do think of Glamping? Have you stayed in an eco-friendly lodge or hotel before? I'd love to hear of your experience in the comments below.